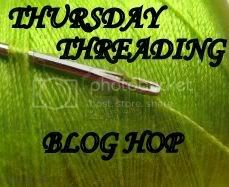 Welcome to Thursday Threading Blog Hop...again. I'm pretty sure majority of us were affected by the blogger maintenance issues so I'm reposting this and extending this hop until Sunday midnight CST. I apologize for the inconvenience. Thank you and have a great weekend everyone! Thanks for hosting the hop! New to your blog and happy to be here. Thanks for the invite and the words of encouragement. Hope I'm not too late here! This is my first time to join a Blog-Hop...I'm so excited! Thanks for hosting this Joy! Just paid a visit to all the blogs listed above. They're all great! Thanks for hosting this again and allowing me to discover them all!